This last week I was passing by a big downtown church that I’ve walked by a dozen times, when I noticed that, unusually, the doors were open. Not only that, there was a big sign on the sidewalk that said: “come in, we’re open”. Now, I’ve always wanted to see the inside of that church. So why not, right? Inside there were a few people milling around looking at things and some folks in the pews just sitting. I stood there a second and then a young woman approached me: “I’m a volunteer guide,” she said cheerfully. “Do you have any questions?” Great, I thought – this gets better and better. Not only are the doors open, I get my own personal guide. So I asked her about the stained glass. She never skipped a beat. Immediately she pointed up to the front. Do you see that panel there? I squinted. Yes. That’s a Canadian soldier, she said, with an air of great authority. And do you see that one there? I looked. Yes. That’s Saint George. And that one there? I nodded. That’s St-Iona. Then she gave me the date of the windows too. I was so excited at having my very own guide that I almost didn’t realize at first what she’d said. Umm…. Wait a minute, I said, finally, almost apologetically, when it hit me. Did you say “Saint Iona“? Yes, Saint Iona, she repeated. Again, that air of absolute authority. As if she’d been studying Saint Iona for years and had become the world expert on all things Saint Iona-ish. The problem is: this is something I actually know a bit about. Iona isn’t a person. It’s an island. Last I checked, pieces of land can’t become saints. Except sometimes towns in Quebec! Isn’t Iona an island? I asked her. I was honestly confused. Maybe I’d heard wrong. Do you mean St Columba, I said to her, you know, the saint who lived ON Iona? For the first time her face dropped a little and her voice became just a tad less authoritative. Oh…she said….right. Then she looked away. I meant to say St Columba. I must have gotten my words mixed up. Saint Columba….you’re right. Then she looked up again at the window. But that person there? she went on. That’s a Canadian soldier. And that knight is St George. Her certainty started to come back and with it, her tendency to point. I noticed, at this moment, that the OTHER woman at the desk, an older woman, had been watching our conversation with a worried look. She came scurrying over. “What did she tell you about the window?” the older woman asked. She was looking steadily, and a bit accusingly, at the younger person. “I just said what it was,” said the younger woman. “Well?” asked the older, looking at me. I hardly knew what to do. All I’d wanted to do was to see the church. Who do people say that the Son of Man is? asked Jesus. It seems like a fair enough question. Who do people say the Son of Man is? But it’s a tough question. One theologians are still trying to answer, two thousand years later. In the Gospel of Matthew, when Jesus first asks this, apparently all the disciples have a go at an answer: Some say John the Baptist, says one. Others are guessing Elijah, says someone else. They think perhaps Jeremiah, shouts out a third. Or maybe one of the prophets, adds somebody from the back. So long as it’s general, it’s easy to have opinions. I have an opinion about how best to lose weight. Just don’t ask me if I’m doing it. Or if someone says to me: ‘what are people saying these days about how best to help save the environment?’ I have lots of opinions about that, too. I could show you books. But if that same person were an environmental activist, and were to turn to me and say ‘and what do YOU say? What are YOU doing?’ that’s a different thing entirely. So long as it’s general, a question is just a topic of conversation. But if you read the Gospels, Jesus is never safe. Jesus does what Jesus ALWAYS does: he makes it personal. On Friday a friend of mine gave me a bag full of fresh chanterelles mushrooms that he’d picked out in the woods in the Eastern Townships. At first when he gave them to me I was so happy I could hardly wipe the grin off my face. What luck! What a generous thing to do! I’ve had pfifferlingen in Germany and was lucky enough to pick some in Sweden last summer with another friend. I didn’t think I’d get a chance this year. I couldn’t wait to get home and saute this batch up with onions and start eating. As I hurried home I could taste them already. But then while I was walking I started thinking. My friend in Sweden is a mushroom expert, who has taken courses in how and what to pick. My friend in Verdun, so far as I know, isn’t. A nice guy, and probably knows a lot about them. He and his wife had probably eaten from this batch, I was pretty sure. But the words “pretty sure” kept sticking in my mind. I put the mushrooms in the frying pan, sauted them up, and they looked beautiful. But by the time I’d put them on my plate, that bit of doubt had gotten lodged. What if my friend had made a mistake? The wrong mushrooms….well. You know. The point is: in the end, doesn’t faith always come down to a person? Do we TRUST ourselves to this person? Opinions are cheap. But when someone asks us what we’re really willing to put on the end of our fork, then we realize, even in that little bit, what faith is. Who do YOU say that I am? asks Jesus. And the response cannot simply be “I believe this and this and this about you.” That’s information. 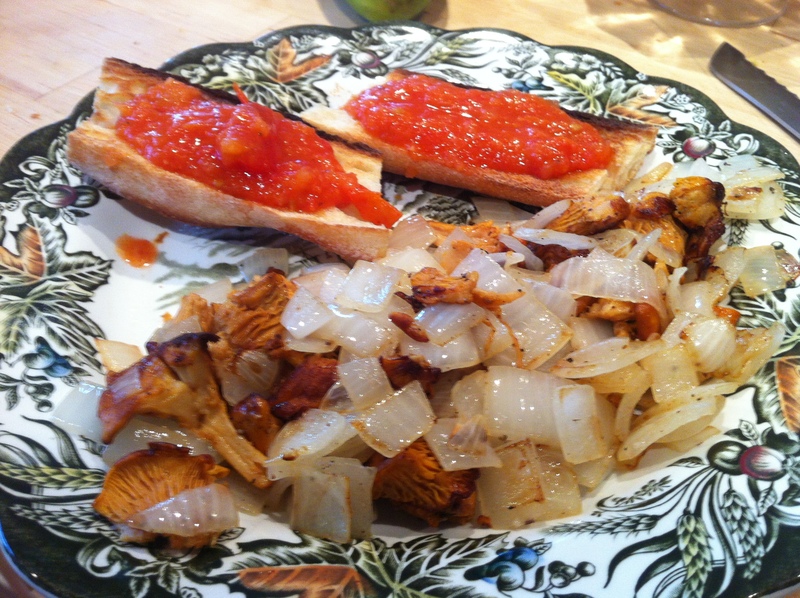 What trust is, is “I believe YOU.” Enough to eat the mushrooms, which I did, and they were delicious. Or in the case of Jesus, enough to follow, and to try to understand how to live under the cross. Enough to take time over years to learn from your living presence about suffering, and hope, and death, and life, and being real, even in pain, and about solidarity and justice, and peace that passes understanding, and a spirit that wants to shout out sometimes from the pure joy of living. The question who do you say that I am? isn’t to be answered with some kind of proposition. We don’t say to the person who has just unburdened their heart in front of us and broken into tears: I believe you are a friend. Or I believe that once upon a time you must have been a friend. To someone, somewhere. We say: I am your friend. You are mine. Here I am. Here is my hand. This week in the big church downtown, it turned out that my tour guide really didn’t know what she was talking about. The older guide had to set me straight about just about everything. Belief isn’t something abstract and it’s not something automatic. It’s not even a thing, really. It’s about people, and what we’re willing to commit ourselves to and test and forge, and forgive, and learn from and grow into. Sometimes, as with my guide, we make mistakes. Belief is taking a chance, because in a relationship there’s always risk. Even with Jesus. But if we DO risk, if we DO trust, then we begin to build the links that can guide us in life AND in death. And Jesus says that if that happens, even “the gates of Hades will not prevail” against such a faith. Pray God it’s true, and trust God it is. On Friday I stopped by my local grocery store to get something for a recipe I was making. 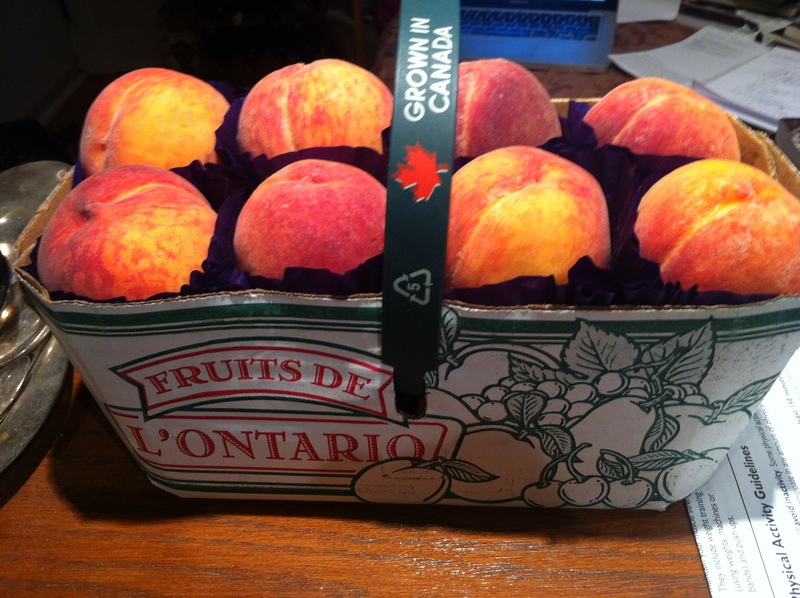 As you probably already know, the Ontario peaches came out this week. There they were, on sale, so I stopped at the display. I lifted one basket out and looked at the fruit. The peaches weren’t ripe yet, so I replaced that basket and was just lifting another out when a man, who was looking at the same peaches beside me, did something strange. Up to that moment I hadn’t really noticed him. From the corner of my eye he seemed normal enough – perhaps unshaven and a bit rough, although that could be my memory playing tricks. A man in his mid to late 50s, maybe, a bit older than me. Shorts and a black tee-shirt. Nothing worth remarking. But what he did was noticeable, and it was this: he’d been checking the peaches in another basket and apparently, must have found one he didn’t like. While I was lifting out my basket, he reached over, put the bad peach right on top of MY basket, and then took another. Very slowly and deliberately, I removed the offending peach from my basket and put it right back where it belonged – in front of him. “There are bruises on it,” he said, when I turned fully around and glared at him. “Fine,” I answered, “that’s your problem. Not my basket.” He looked absolutely undisturbed. “Not your basket,” he repeated, and turned, and chuckled, and walked off. It’s not everyday we come across such examples of what I would call entitlement. But it’s not exactly rare, either. Entitlement means believing you have a right to something, or to an a action, in a way no one else does. In this case, this man’s desire to get rid of a peach meant he could care less where he put it, even on top of my basket. The guy who throws garbage out the window of his car is falsely entitled, or the former Alberta premier who skims money from the public purse. The police in Ferguson Missouri who feel they don’t even need to explain why an unarmed 18 year old black youth was shot several times when his hands were up in the air are really horrific examples of entitlement, and of an attitude toward oneself and others that has gone badly, badly wrong. Entitlement comes out of, and leads to, injustice. Our world, however, tells us that in one sense at least we have to be entitled. ‘The only way to get ahead is to believe in yourself’, say the best-selling books. “No one else is going to give you anything – you have to take it.’ Never apologize. Never look back. The squeaky wheel gets the grease. We all know that at least. The woman we heard about today in Matthew’s story of Jesus, was just doing that. She was the squeaky wheel. She was taking what she had to take, damn the consequences. It must have taken guts. Because there were all kinds of reasons why this person shouldn’t have been approaching Jesus. Number one: she was a woman, and he a man. Number two: she was not Jewish, and Jesus was an observant Jew. Number three: she was a Canaanite, the first-century version of being black, or native, or whatever downtrodden minority you want to mention. You know how annoying beggars downtown can be, or those guys who do squeegee on your car windows? That was her. It’s no wonder the disciples are quoted as saying to Jesus: Send her away, for she keeps shouting after us. They were probably embarrassed to have her around. A dirty little Canaanite. So in point of fact, she WASN’T like the man beside me dumping his bad fruit on my basket. And she really wasn’t acting entitled. You can tell that from what happens next in the story. She comes to Jesus, kneels, and says Lord help me. He responds in a way that, to be honest, sounds a bit entitled himself: It is not fair to take the children’s food – meaning, my healing is intended for Jews – and throw it to the dogs. Meaning, you. She should have been upset. Enraged, even. At least as frosted as I was about the peach. Instead, she answers Jesus like this: Yes Lord, but even the dogs eat the crumbs that fall from their masters’ table. This is not false entitlement. This is real bravery. She is standing up for what she needs – actually what her daughter needs – and she doesn’t mind the trouble, or ridicule, she will endure to get it. And the good news is, Jesus calls this faith. Great is your FAITH he says to her. In other words, if this incident is to be believed, having faith is reaching out and grabbing on to our Lord for help even and perhaps especially when we don’t feel we deserve anything. But it does not come out of a sense of defeatism or a lack of self-worth. That Canaanite woman absolutely knew she was worth something, labels or not. Faith is what she did. It is reaching out for help, for what we need, or for what someone else needs, for JUSTICE, for mercy, and for healing, even if no one thinks we, or they, deserve it. Too often in the church we think there are only two options: either the entitled jerk, or the too-nice, smiley and polite victim. And since we don’t want to be jerks we play the nice guy, the victim, even if we don’t really feel that way. The Canaanite woman was NOT being a victim. Not even playing at it. She was standing up for herself. She was being courageous. AND she was testing the boundaries of what was allowed. But she was doing it honestly, and with an eye to others – to Jesus, but first of all to her daughter. The other bit of news we’ve been hearing about all week is the suicide of Robin Williams. Those of us who haven’t gone through it can’t pretend to understand severe depression. But what people who have experienced it say, is that it is like living in a prison. Somehow, in spite of living in that prison, Robin Williams brought a great deal of joy to a great many people. There is a special tragedy in the fact that in the end, he was not able to escape the prison himself, and to have the confidence to reach out for help again. That should never be a cause for judgment, but for mourning. The actor felt, in the end, like he could not reach out to anyone. We can, but it is not easy. It requires a balancing of ego and need, of self-understanding and love. Great is your faith, says Jesus to the Canaanite woman. Rare, but not impossible. When I arrived at the cashier on Friday, with my peaches in hand, guess who happened to be the person right in front of me in the line? Of course. God must have been having some fun with me Friday. Okay, I thought. He’s just a weirdo. The world is full of them. Have patience and remember the times you’re a weirdo too. So I stood and waited my turn. There was a young woman at the till, maybe 20, 25 years old, and this fellow was saying something complicated to her about marking his groceries for delivery. I hadn’t been listening. All I heard was the very end of their conversation. “You’re lucky I didn’t ask you for your telephone number,” he said to her. “Pardon?” she said. “Your telephone number,” he repeated, not looking at her. Then that chuckle again, and he walked off, not looking back. I could see the young woman stiffen. Her facial expression didn’t change, but there was a bit of colour that came into her cheeks. I looked the other way, and waited. Embarrassed to be a man, and a man my age. There was nobody behind me, so I had lots of time. Finally, a minute later, I heard her say ‘Bonjour,’ to me as if nothing had happened. The Canaanite woman was not entitled, or rude. Her self-confidence was not selfishness or thoughtlessness, or a delusion that made others around her miserable. She had found that balance, that blessed balance between need, and doubt, and courage, and self-awareness, that Jesus calls faith. There are a hundred times a day when we are tested. May we learn, in this case, not so much from Jesus, as from the under-class woman who showed what dignity and faith, what courage and love look like when they all comes together in the presence of our Lord. And learning that, may we too model justice, and find mercy and healing.